The Two Witnesses - Yah's holy alliance! Buried Within the Pages of Time! Out of Egypt Yahweh calls the children of His faithful servant Abraham (son of Shem, Noah, Seth, Adam, in the line of the "promised seed"), that the power of Darkness over the souls of Earthling Mankind be broken: the head of the liar/serpent, being "crushed," even by the "heel" of the Savior of Israel (Genesis 3:15~Murdock, 1851). The First Testament ("old") and the Second Testament ("new") are as "two witnesses" attesting to the Covenant of Yahweh with Mankind. Yahweh gives to His chosen Israel, via. His servant Moses (of the Tribe of Levi), the Plans for His Earthly Sanctuary and it's Services, "that I might dwell amongst you." The design and construction of the Sanctuary that Moses built on Earth in the community of the Israelites, was according to a "Heavenly Plan." It's function, construction, activities and services were quite detailed, and once accomplished, the Israelites "out of Egypt" performed it's services, as Yahweh's Presence or "Shekinah" (Cloud of Glory) hovered over the "Seat of Mercy" above the "Ark of the Covenant," within the "Most Holy Room" of the Tabernacle. This holy Sanctuary and it's Services represent to Yahweh's people, even a Plan for Salvation which our Creator has devised from the very beginning of our Cosmos, that Mankind might be freed from the grip of Temporal Nature and from the power of the grim Adversary of Life. 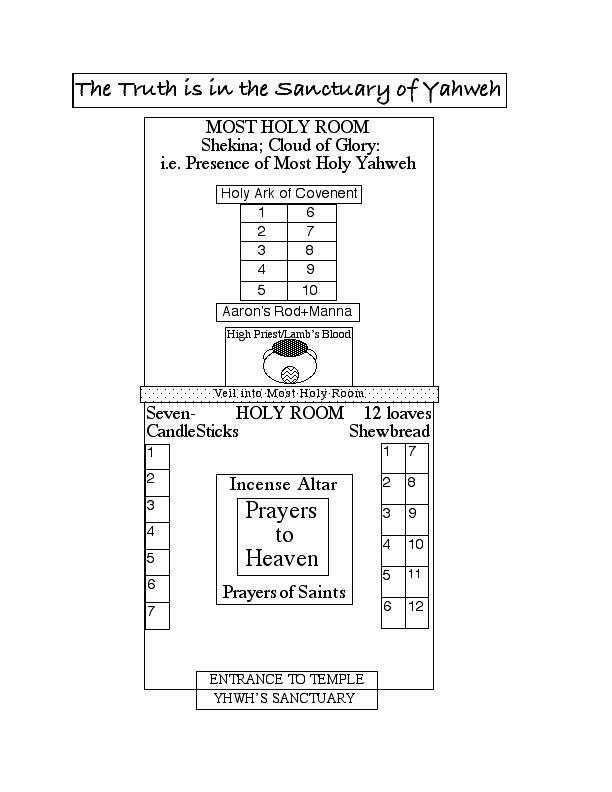 As in Heaven, so also on Earth, the Sanctuary on Earth being patterned after the Heavenly and Spiritual: and so the "Plan of Salvation," to which this Sanctuary and it's Services attest, is a Heavenly and Spiritual accomplishment, even for the benefit of Earthling Mankind. It's purpose is to raise mankind's consciousness (and behavior) to a height of spiritual awareness (and activity) to which we are not so naturally inclined in our mortality. This Plan of our Creator, is to create from out of Nothing (the Void, or "Deep"), Something, even spiritual children, singularly for Himself. It is His personal 'pet' project, for His own pleasure and ends. Yahweh illustrates for us, in spirit, His Heavenly, even Universal Realm, and the Law and Order He has ordained for it's peaceful and profitable perpetuation; we are floating about in Space, in the Eternal Heavens of Yahweh who has filled the "Void," or "Deep," with the truly marvelous works of His unfathomable genius. (2.) Who then comes, and testifies of his Testifier: the first "Mosaic" Covenant being the Covenant of Justice and Condemnation; but the second or New Covenant being the Covenant of Mercy and Pardon. 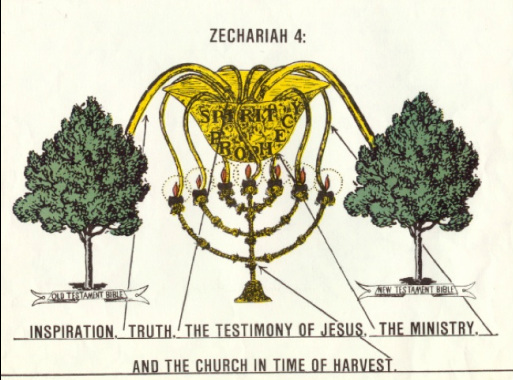 The First Covenant (Law & Justice) and the Second Covenant (Mercy & Pardon), as "Two Witnesses" testifying of each other ("the Olive Tree/s and the Lampstand": Zechariah 4:2~3; Rev. 11:4), are recorded as a living witness in the lives, beliefs, traditions, festivals, laws, history and literature of the Hebrew Nation, the People of Yahweh (Israel). Both Witnesses testify of the Plan of Salvation and Redemption for fallen Earthling Mankind; and of the Lamb of Yah, who is the Savior/"Redeemer of the World," and Yahweh's "Right Hand or Arm." Both testify, that we might know of our true Creator and realize faith in Him, even Faith in Life, and in the Spirit of Life; even in His "Anointed One" whom He has sent: "Shiloh" (Heb:"sent"), the Messiah, in whom is manifested to us the fullness of Yah's Spirit, Authority and Power, even for the purpose of our Redemption from Entropy. The First Covenant testifying, that we might believe that Yahshua the Nazarene is in fact this Anointed One, sent by Yahweh for the purpose of our Redemption; and in our believing in and embracing this One "Sent," so the purpose of the First Covenant is fulfilled in us, even by our faith in this One, that we may be sanctified by this excellent Grace, unto Eternal Beingness, even by way of the Truth revealed by the holy Spirit given to us upon evidence of our faith and belief in this Shiloh, the One Sent, and in his name Yahshua (Joshua), to whom the prophesies point = the Son of Yahweh. Law/Justice/Condemnation is over us in the temporal/carnal (or mortal) state of beingness, even to the end that we may believe in this Nazarene who is Yahshua; and when we do exhibit that belief and embrace this Nazarene and his Faith, so in the spiritual and eternal state of beingness (immortal), indeed, "His Grace is Sufficient." To remain in or retreat into 'the Law' (or Mosaic Covenant of Rigid Justice) is to remain in Condemnation, thus we are disqualifying "Grace" (Messianic Covenant of Mercy and Pardon), even denying the second testimonial (or "witness") and so therefore denying also the first witness (or testimonial) which testifies of the second: evidencing not faith, but UNBELIEF in the Love, Mercy & Pardon of Yah, which love is exhibited in Yahshua, Yah's Anointed ("Messiah"). But the fullness of El's (God's) Grace must be appreciated, for the purpose of sanctification, to the end, fulfillment of our personal and collective human potential (even fullest respect for our Cosmic Birthright). As "the Law" was over us in the temporal/carnal state of beingness, so now is His Grace over us in the eternal/spiritual state of beingness. Such Grace is above the rigid Justice and Condemnation of the Law (even as the Seat of Mercy is ABOVE the inscribed Stone Tablets of the Law, in the Ark of Yahweh's Covenant, in the Most Holy Room of His Sanctuary in Israel): for Grace bespeaks Mercy & Pardon, and unsurpassed loving Faith, even granting us peace of mind in Yah's Forgiveness and acceptance. And so Yahshua is the "fulfillment of the Law," and "not a destroyer of it." He IS the very Height of Justice, even the Mercy of Yahweh, (and it is his "Lamb's blood" that is sprinkled upon the Seat of Mercy). In belief, faith, and trust in him, even in this "Shiloh," are we keeping the Testimony, for this end always was it's true purpose, and so it's purpose is fulfilled even in our evidenced faith in this Nazarene. It is therefore not necessary to perform works of (Mosaic) Law in order to propitiate our Creator Deity, for by His Grace He receives us, even upon evidence of our faith in "Shiloh," and so we are acceptable to Him ("the feet only need to be washed, the rest is clean"). The instruction of the Torah ~ Mosaic Covenant (of Justice & Condemnation), with it's promise of Salvation, amplifies Messiah Yahshua, that we may recognize him and appeal to him for Mercy and Pardon, his being the "saving arm of Yahweh." Thus is our faith established, even by Yahweh's Grace which He has hidden in His Anointed One: even by our personal belief and faith in Yah's first witness who is this Nazarene. Moses is the means to Yahshua, and so when Yahshua is achieved, Moses becomes obsolete (even as rigid justice and condemnation become obsolete under the grace of mercy and pardon). But the Treasure housed in the Sanctuary of Yahweh is never obsolete, but is necessarily Established and Upheld by this Yahshua. Therefore Yahshua is established as the true means to Yah, by Yah. The Plan of Salvation is a Messianic prophesy of the holy Sanctuary, indicating Messiah's Saving work for all Humankind: even that his innocent blood may be imputed to all of us who embrace Pardon and Mercy, subscribing to this Plan of Salvation. mocked 3 years but Arise Again when: ....................... END, Dark Age 1.
with the Holy Roman Emperor's Crown, ..................................... Arise! Or Gone for the Day, with His Spirit, to Roam? 2. Feast of Unleavened Bread ("Pesach Week"): Springtime of the year; festival that follows the High Sabbath Day of Passover/ Pesach, with a second High Sabbath and seder (feast meal), and stretching on to the 22nd of Nisan; significant of Israel's escape from Egypt, when they couldn't make bread with leaven. 5. Day of Atonement (or "Yom Kippur"): in the Fall of the year, in the Hebrew month of Tishrei (Sept/Oct) when the Sanctuary High Priest enters the Most Holy Room (once a year) to sprinkle lamb's blood upon the Seat of Mercy, above the Golden Ark of Yahweh's Covenant, for the sake of Israel's Pardon (from sin); and when the "Scapegoat" ( significant of Satan ) is sent into the wilderness. Yahweh's highest ritual Sabbath, of the year. 7. High Sabbath Day after Feast of Tabernacles, Eighth Day, thereof: significant of Completion, of Judgment, of Resurrection, even Translation into (eternal body), Overcoming Sin & the "Flesh," the World, and Satan (Scapegoat), to inherit Eternity. 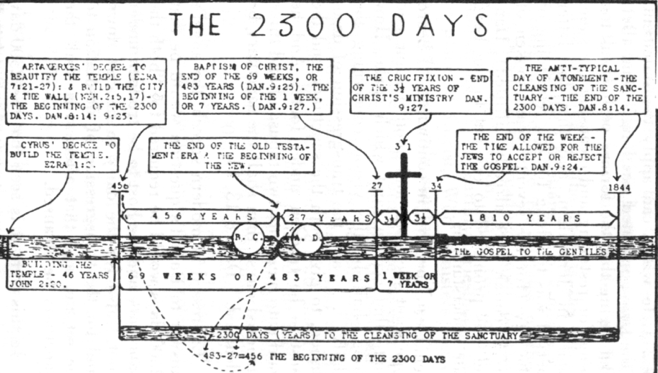 note: The Hebrew Holy Days mentioned here, pertain to the ritual Sanctuary Services which are significant of the Plan of Salvation ordained by Yahweh via. His servant Moses: this Plan of Salvation is for the Salvation of Yahweh's people, even "spiritual Jews." Father forgive them, they know not what they do. Father have mercy, they are not like you. how can they survive such loveless misery? Father forgive them, they're blind to your glory! Father forgive them, though they don't behave. O' Yah, for my sake, free them from their graves! Father forgive me, for hurting you! Father forgive them, they cannot know You. Emmanuel must show them what to do. Father forgive them, atone from transgression! O' Father, tell them of your faithful Plan! to traverse the Narrow Path to your promised Holy Land! 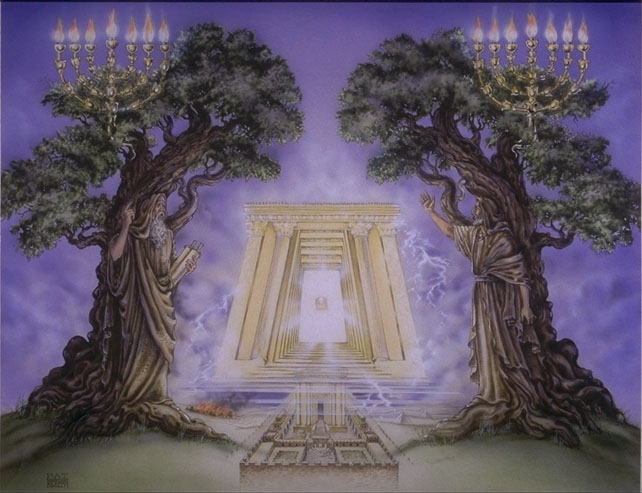 LAST DAZE PROPHESIES: THE TWO WITNESSES. 19:11-19:16; Heaven opened: a white horse, Yahshua upon it, with a NEW NAME, called the WORD OF EL. Out of his mouth, a sharp two edged sword, to strike the nations/defiant. He will rule Earth with an iron rod. Zechariah 3:1-3-6-7-8-9; "For lo! the Stone which I have set before Joshua, upon one stone seven pairs of eyes- So will I take away the iniquity of the land in one day." (13) Knowest thou not what these are? And I said, No, my master, Then said he: These are the TWO ANOINTED ONES who stand near the Sovereign of Earth."